Convert miles and yards into kilometre and metres. Conversion table included for the first 50 miles. 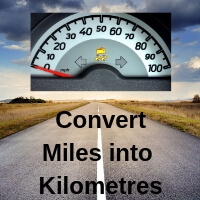 Convert miles + yards into kilometres + metres. Enter a value in to the Miles and yards text box and click associated Get Results. Kilometres and metres value is below. Decimal places are accepted with the input.